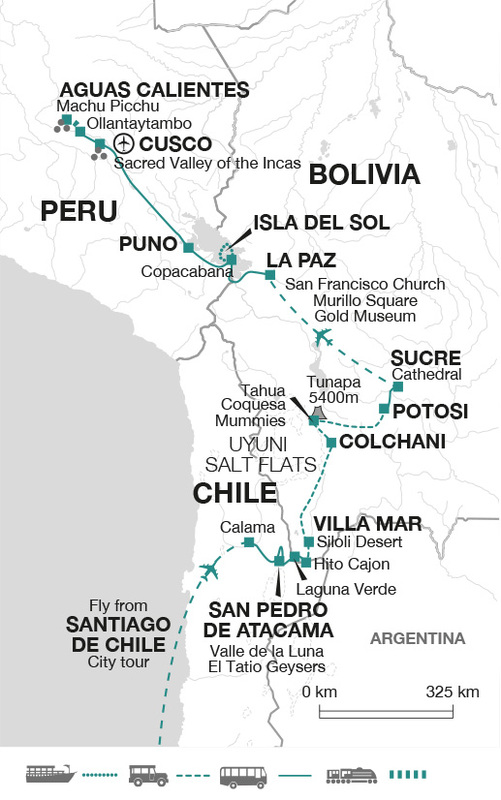 A classic Andean journey covering the highlights of Chile, Bolivia and Peru, from the Chilean capital of Santiago to the magnificent Inca citadel of Machu Picchu in Peru. Along the way, explore the superbly maintained ancient city of Cusco, see flamingos feeding in bright red lakes, flanked by looming mountains, and discover the generous spirit of the Andean people. The trip ends this morning in Cusco after breakfast. Sacred Valley - Visit to Maras and Moray approximately US$ 58 ( min 4 pers), Whitewater rafting US$ 75 (depending on numbers).